St. Thérèse of the Child Jesus was throughout her life particularly devoted to the Infant Jesus just as her great spiritual mother, Teresa of Avila, had been. Thérèse placed an Infant statue in the novitiate at Lisieux when she had charge of the novices, because she knew how many blessings the Divine Child brought to the Carmelite novices in Prague when it was placed in their midst. The same statue still stands in the cloister at Lisieux. 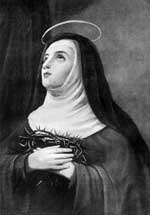 The spiritual teaching of St. Thérèse of Lisieux is often called the "Way of Spiritual Childhood". Her most simplistic approach to attaining holiness is deceptively simple but it has the power to make each one of us a Saint! The infancy of Jesus was for her a source of inspiration. St. Teresa of Jesus, always traveled with her statue of the Infant Jesus when she was establishing new convents. 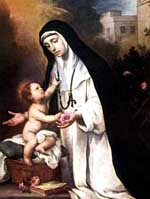 Her devotion to the Infant Jesus was established after an very interesting incident. One day Teresa of Avila was coming down the steps of her convent when she saw a beautiful young boy. The Child spoke to her and said: "Who are you?" Teresa answered: "I am Teresa of Jesus, who are you?" The Child answered: "I am Jesus of Teresa!" St. Anthony often meditated upon the great humility of Jesus in His Incarnation. One night, his little cell suddenly filled up with light. Jesus appeared to Anthony in the form of a tiny child. Passing by the hermitage, the count saw the light shining from the room and St. Anthony holding and communicating with the infant. The count fell to his knees upon seeing this wondrous sight. And when the vision ended, Anthony saw the count kneeling at the open door. Anthony begged Count Tiso not to reveal what he had seen until after his death. As early as five, Rose knew that everything was possible if you have faith in God. Rose wanted to learn how to write and read, but there was nobody that could help her. Her mother had tried to do so, but soon grew tired and gave up. So the child decided to pray to the Child Jesus, she said, “Since no one has time to teach me things, I am going to ask God to do it. He can do anything can’t He?” So, everyday Rose recited the following prayer: “Lord, help me to know and love You, and teach me to read and write.” Later, Rose announced to her mother that she knew how to read and write. She also told her mother that The Child Jesus had taught her. The mother was in disbelief but nevertheless Rose proved to her mother that she knew how to read by reading a book about St. Catherine of Sienna. The Little Child Jesus worked a wonderful miracle by teaching Rose Himself how to read and write. With God everything is possible. Once as a young child, St. Gerard was praying before an image of Mary in the Church. Suddently, the Child Jesus came alive in His mother’s arms and gave St. Gerard a piece of bread to eat. The bread emitted a heavenly fragrance. St. Gerard would often share this story with others, with the greatest naturalness, as if these miraculous events happened to everyone else in the world. St. Nicholas was devoted to rigorous practices of fasting and abstinence, as well as long periods of the day devoted to praying with others and private prayer. He believed in the power of prayer and sacrifice especially for the souls in Purgatory. At times, Nicholas devoted himself to prayer and works of penance with such intensity that it was necessary for his superiors to impose limitations on him. At one point he was so weakened though fasting that he was encouraged in a vision of Mary and the child Jesus to eat a piece of bread signed with the cross and soaked in water to regain his strength. Thereafter he followed this practice in ministering to the sick himself. In his honor the custom of blessing and distributing the "Bread of Saint Nicholas" in continued by the Augustinians in many places today. St. Jerome was attracted by the mysteries of the birth and childhood of Jesus. He even went to dwell in Bethlehem living near the cave, which Christians believed to have been the birth place of the Divine Child. From the first months of her novitiate, in fact, Margaret saw herself chosen by Jesus to honor His infancy and His crib. She confided as much to the novice mistress, Mary of the Trinity, of Quatrebarbes: «The holy Child Jesus,» she said, «keeps me constantly intent on the moment of His holy birth, and He has made me concentrate on the first twelve years of His infancy in such a way that He has given them to me wall and an outwork beyond which He does not permit me to venture.» This mission, therefore, will be the grand, unique occupation of Margaret's life; and her entire existence will be a continuous dialogue with the Child Jesus, a total adhesion to His state. It was the privilege of the venerable to reproduce within herself, interiorly as well as exteriorly, this state of the Child Jesus. Frequently consoled by special illuminations on the state of God as a child at Bethlehem, she carried about «the impression of His holy and divine infancy.» For a long time she manifested exteriorly «a participation in the state of the Child Jesus in the crib,» even remaining «lying on the floor for many days without being able to rise, and from time to time emitting a little infant's cry. Her appearance and all the movements of her face were changed and became altogether like those of a new-born child...» During this period she received ineffable insights and knowledge about the state of the Child Jesus in the manger:.. His littleness, His divine weaknesses and His abasement..::. (Ms. n. 9, f. 255, of the Carmel of Beaune,. a text partially cited by Deberre, Histoire de la Venerable Marguerite, pp. 108-9). For many years these divine favors remained Within the ambit of the community of Beaune, but after 1638 great changes took place. The Child Jesus called Margaret to work actively for the salvation of souls; He revealed to. her that in His divine infancy she was to find the means of obtaining the mercy of the Father. At the same time He taught her the way of honoring His holy infancy from the moment of His incarnation until his twelfth year. The Child Jesus wanted the project that He communicated to her to have as its title: «the family of the Child Jesus.» Following these directives, Margaret, beginning on March 24, 1636; brought together the «household and associates of the Child Jesus.» The associates were to celebrate the twenty-fifth day cf every month in memory of the Annunciation and of the Nativity, every day to recite the abbreviated rosary, called «the rosary, of the Holy Child», and to meditate, week after week, on «all the actions, words and mysteries» of the Child Jesus. But the fundamental obligation which they assumed when they inscribed themselves in the association was that of following the states of the Incarnate Word «in a holy union of heart and of spirit,» since the best way of «honoring the simplicity and the kindness of the holy Child Jesus is that of constantly practicing a most perfect simplicity, kindness, pleasantness and deep humility of infancy. An association was formed and as soon as the existence of the association of the holy Child Jesus became known, enrollments multiplied.